A. 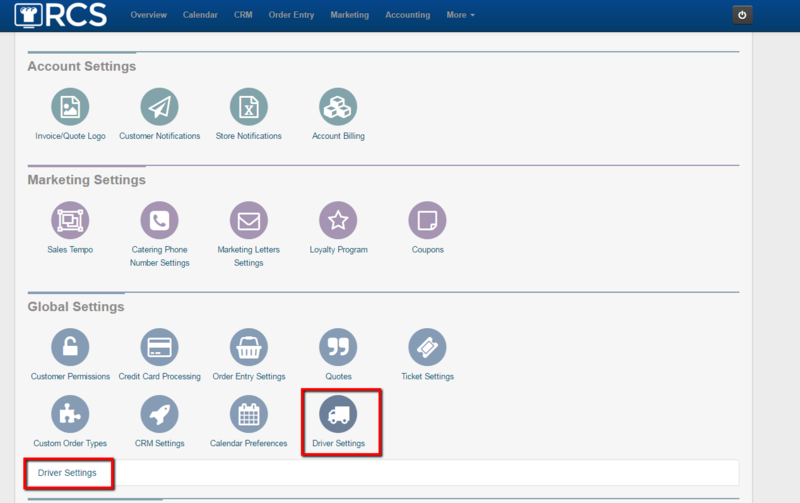 To access the Driver Settings, click the ADMIN tab and scroll down to the GLOBAL SETTINGS section and choose the DRIVER SETTINGS bubble and click on the DRIVER SETTINGS link. 1.Reports Checklist: When the driver logs into his interface, you can have him view up to four different reports to be checked off while loading and delivering the catering order. Check the box(es) off you want the driver to use. A. Show Item List: This shows the items ordered. If you have not created any prep or production reports, this is the only setting needed. B. Show Kitchen Production Report: This will show the driver the Kitchen Production Report for the order. C. Show Food Prep Report: This will show the driver the Food Prep Report for the order. D. Show Pull Sheet: This will show the Pull Sheet for the order. 2. Allow Customer To Add/Adjust Tip: Check this box if you will allow the customer to check out with the driver by adding a tip and signing the receipt. 3. Default Tip Percentage Buttons To Show: You can have the system show the the customer the amount of their tip based on set percentages you enter. This allows them to see what dollar amount corresponds with each tip percentage you have set. The catering client is also given the option of leaving no tip or adding in a different amount manually. 4. Notify Customer By Email: The Drivers Interface allows the driver to let your catering client know when they are on their way and also once they have arrived via email. Check the desired option(s). 5. Notify Customer By SMS: The Drivers Interface allows the driver to let your catering client know when they are on their way and also once they have arrived via text message. Check the desired option(s). NOTE: The catering client must have their mobile number in the CRM for a text to be sent. There is an 8 cent for charge to you for every text message sent. 6. SMS: The boxes below allow you to customize the text messages that go out for the "I'm On My Way" and the "I've Arrived" messages. 7. Order Fields Visible When Customer Is Approving Order: When a customer is handed the phone to review the order, add a tip and sign off on the order, you can choose which ticket fields are visible to the customer. Check off any/all that apply. 8. Thank You Message: This allows you to edit the message a customer sees after they sign off on an order. After you have gone through all of these settings, click on the blue button labeled "Save Settings". 9. "On My Way" and "I've Arrived" Email: These individual boxes allow you to customize the email a customer receives when the driver is on their way and when they've arrived. NOTE: DO NOT delete the broken image in the email. This pulls the driver's pic from their profile and inserts it into the email the customer receives. The picture allows the customer to know who to watch out for. To save each email click on the blue button called Save "On My Way Email" or Save "I'm Here Email".